The battle for Mobile Broadband is heating up in the UK. At the weekend, Orange launched their latest offer to try and entice UK must-have-data freaks onto their network. 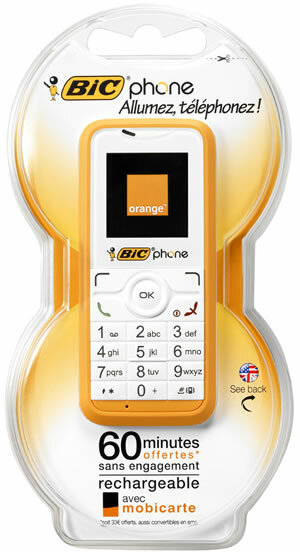 BIC, famous for disposable pens and lighters, is launching the BIC Phone in France today. As with their other products, the BIC Phone focuses on core functions – making and receiving phone calls & texts. Available in two playful colours, citrus orange and lime green, the USP of the BIC mobile phone is that it’s ready to go when you buy it. None of this normal fiddling around with wrestling the battery out of the packaging, finding the charger and leaving it for X hours to get it ready to use – the BIC Phone is charged a ready to go. Orange France have picked up a deal with the US studio Paramount Pictures, to distribute their content in France. It’s not just old content that will be available, but new productions from Paramount including DreamWorks titles, which will be among the latest films available. Orange France customers with a broadband digital television package or a High-Speed Internet package will be able to enjoy a Video-On-Demand programming schedule including the studio’s latest releases, such as Mission Impossible III, Over the Hedge and World Trade Center, among others. There’s over 2,500 films, in French or original language versions with subtitles, available on the 24/24 Video service currently, which costs from 3 Euros to rent for 24 hours. Usual features such as unlimited viewing, pause functions and fast forward and rewind are available. The BBC are going to start of a trial to syndicate a range of its television channels and radio networks via 3G to mobile phones within the month. Three UK operators will be taking part, Orange, Vodafone and 3 giving subscribers to the trial the ability to watch BBC One, BBC News 24 and BBC Three streamed on their mobiles. Beyond some sports programmes and programmes where they don’t have the necessary rights. As well as the TV channels, eight radio stations will also be included – Radio 1, 1Xtra, Radio 2, Radio 3, Radio 4, 6 Music, BBC 7 and Asian Network. Appropriately enough the announcement by Richard Halton, BBC Controller of Business Strategy, was made at the Broadcast Mobile TV Congress. We’ll keep our eyes on this.